While Roger Corman’s 1960s adaptations are the best known and most successful adaptations of Edgar Allan Poe’s works, they were hardly the first. 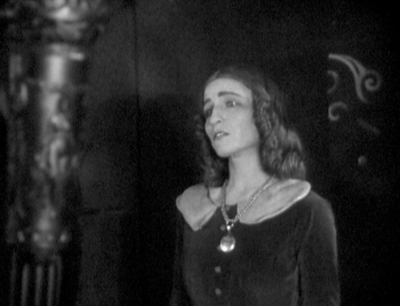 Adaptations of Poe’s work to film stretch back to 1908, although it was not until 1928 that not one but two adaptations of The Fall of the House of Usher were released. 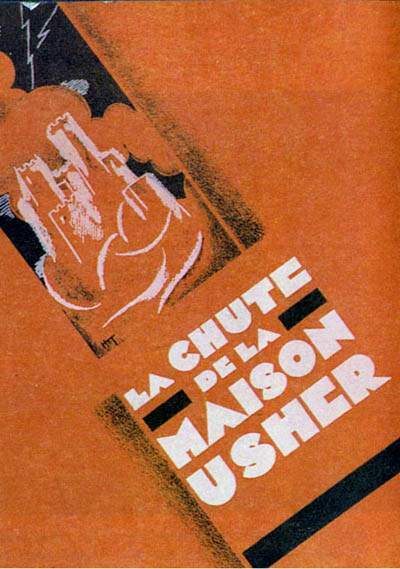 One was an experimental American short film, the other a full length French film directed by Jean Epstein and co-written by him with famed surrealist filmmaker Luis Brunel. 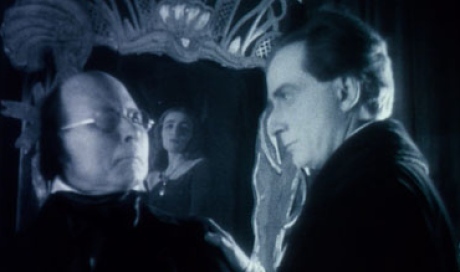 Many critics consider the film a masterpiece of the Expressionist style of fantasy films made popular in Germany in the 1920s. Quite frankly, this is inexplicable. 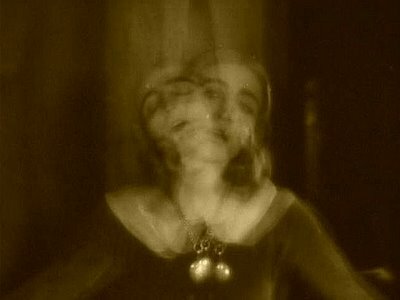 While, yes, films like Nosferatu, The Cabinet of Dr. Caligari, Faust and The Golem all use similar techniques to those used here by Epstein, they did so in the service of telling a story, not padding out a simple idea to feature length. The problem that Poe’s short stories generally present feature-length adaptations can be seen here: how do you stretch a story that fits on just 8 8 1/2×11 pages to fill a film’s entire run time? Note: to those of you who have never read Poe’s story or seen an adaptation, there will be spoilers ahead, as well as spoilers to this particular version of the film. Many of the best Poe adaptations simply put several of his stories together and create an anthology film, others add details (often from other Poe stories), but here Epstein simply pads everything with Expressionistic “atmosphere” that fans of the film consider to be “dreamlike”. Poe’s story is very simple: Usher summons the narrator to him, telling him of his illness, which includes sensitivity to light, noise, taste, and severe anxiety. Usher’s twin sister is also ill, suffering from cataleptic trances. Usher’s friend arrives, finds the home in ill repair and its inhabitants ill or mad, and observes his friends artistic pursuits. Later, Usher’s sister “dies” and is entombed, but of course, she’s not really dead, and Usher knows this. As he goes mad and reads to his guest a great storm comes up, the sister breaks free of the tomb, falls upon Usher, both fall down dead, and the narrator escapes, fleeing the house which, like the Usher line itself, collapses. How does a filmmaker turn a story with such limited plot into a feature? Corman (or more accurately his writer, Richard Matheson) grafted on elements from other Poe tales, added background to the Usher family, and changed the narrator from a friend of Roderick Usher’s to a suitor to his sister, thus allowing for scenes where Roderick decries the corrupt nature of the Usher line. While this approach could be accused of being too literal, pedestrian, or lacking in atmosphere it is far superior to the one Epstein adopts. Epstein’s film contains a great deal of padding which, in theory, provides atmosphere, but which is mostly plodding scenes of men sitting around rooms broken up by the occasional striking image. Epstein also feels free to change the details of the tale-his version allows both Ushers and the narrator to live, and the Ushers are husband and wife, not sister and brother. Assistant Director/Co-Writer Luis Brunel apparently left the film over these changes. The actors deliver mixed performances. Jean Debucourt’s Roderick Usher has an otherworldly presence about him that works well in some ways, though he lacks the signs of neurosis and illness one might expect and comes off more as a brooding artist. Marguerite Gance leaves little impression beyond the idea that men in late 1920s France apparently found very different features attractive. She is striking in scenes where she plays her own portrait, however, one of the film’s surreal touches that work. Charles Lamy’s performance as the narrator, however, is simply terrible, coming across as a finicky, annoyed and detached old man. 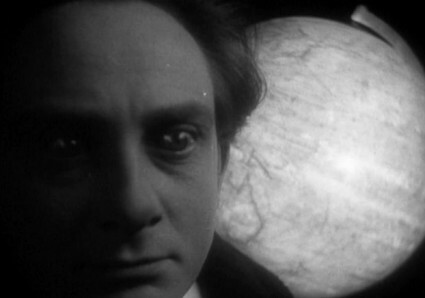 There are scenes with atmosphere and camera tricks that do work; perhaps with a better score (always a major issue with silent films, which were intended to be accompanied by live music) and translated rather than narrated title cards, the film might have more impact. 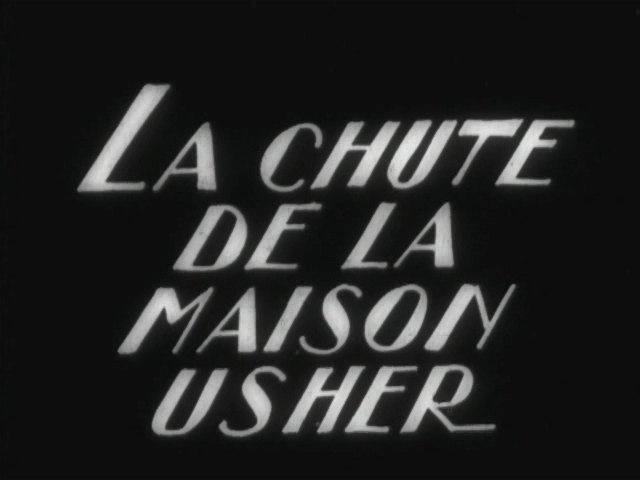 As it is, La Chute de la Maison Usher should be viewed only by film students or other artists looking to steal the occasionally striking images or Poe fanatics. In the time it takes to watch you could easily read several Poe stories and receive more enjoyment than Epstein’s film is capable of providing. This entry was posted in "Foreign Film", Arthouse, Black and White, Full Reviews, Horror, Independent, Old Dark House, Reviews, Silent and tagged buried alive, Edgar Allan Poe, Expressionism, France, Jean Epstein, Luis Brunel.